Many fruits, seedpods and vegetables show fractal patterns, some in spiraling self-similarity and others showing fractal symmetries. 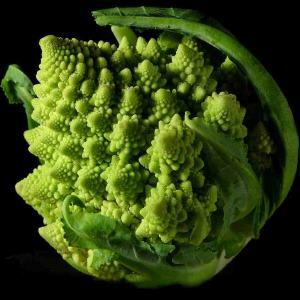 The probably best known example for fractals is the romanesco broccoli. Each of the small sprouts are a downscaled, self similar copy of the whole broccoli. Additionally the sprouts are arranged in a logarithmic spiral. Often we can find Fibonacci numbers in fruits and seed pods. and some more MRI’s of fruits – can you guess what is what?